As someone who has worked from home for nearly ten years, I can tell you that it comes with some pretty nice benefits. But, without a strategy and a game plan, working from home can also bring along some hefty challenges and stressors. You may feel as if you’re always working and never have time for yourself, your family and your home, or you may feel like you’re always trying to get your work done, but your personal life keeps getting in the way! How do you strike a balance? Here are 10 tried-and-true tips to help you be more productive while working at home. Setting a schedule can feel as if you’re giving up one of the big benefits of working from home. But, to truly reap the benefits of a flexible schedule, it’s imperative that you lay a foundation first by setting work hours and non-work hours. To do this, first figure out how many hours a week you need to fulfill your job duties. Then, if you are self-employed or have flexibility about when your job gets done, schedule your hours based on your family’s needs and your own energy highs. For example, schedule your most productive times of the day for job related tasks that require you to be sharp and focused, or set your hours so they are sync with your spouse’s work schedule and / or your children’s school schedule. Once you have decided on your schedule, take steps to make work time focused and productive by finding someone to care for your little ones. If you have preschool aged children, and need to work longer than nap-time allows, childcare is a must. When I started working from home my kids went to daycare just as they had when my job resided in an office outside my home. While it may seem idyllic to work with a child sitting on your lap, what I found was trying to simultaneously do my job and take care of my kids caused my performance to suffer in both areas. Neither my children nor my business got the best me possible. Childcare will allow you to focus solely on your job during work times—which means you’ll get your tasks done more efficiently. This means you’ll have more time for your personal life, and you’ll be less distracted by your job during off work hours. 3. Set up an office area. I often joke that I have a “14 stair commute” but those 14 steps down to my office are significant. Those steps tell me and my family members (who are no longer in daycare, by the way) that I’m going to work. A designated office area lets you physically move from your personal life to your work life even though both reside under the same roof. The ideal at-home work area will allow you to be out of the way of family members and household activities. A room with a door is ideal. But if that isn’t an option for you, use a room divider to partition off your office area. 4. Keep your work area organized. 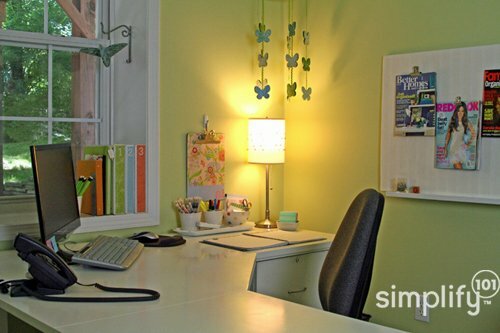 Once you’ve set up your office, keep it organized to be productive. Set up a simple filing system for your business projects and make sure that only these projects are out on your desk during work hours. If you also use your desk for personal projects, be sure to tidy up your desk at the end of the day, so you can easily switch gears to personal business during your off-work hours. 5. Set clear and compelling goals. One of the challenges with working from home is that it’s easy to become distracted by household tasks that need to get done. Clear and compelling work goals will help minimize these distractions by helping you remain focused and excited about your job responsibilities. 6. Make it a habit to plan. Establish a regular planning session into your work week. Use this time to review your goals, projects lists, tasks and deadlines. The ideal planning session will fall either at the start or end of the week, such as first thing Monday morning or Friday afternoon. This planning will help you bring structure to your work week and will further minimize the temptation of household distractions. 7. Use a distractions pad. Sometimes during the work day, even with all of these strategies in place, you may still feel pulled by personal things you want or need to do. When this happens, resist the temptation to stop working and handle those tasks. 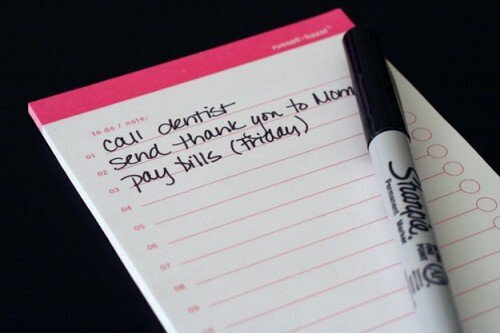 Instead, simply jot down these personal tasks on a pad of paper or on an electronic to-do list. By getting these thoughts out of your head and captured elsewhere, you’ll be able to turn your attention back to the work you were doing. Once you have established set work hours, you can then enjoy the flexibility of working from home by trading time. For example, if the opportunity to volunteer for a few hours at your child’s school comes up during typical work hours, you can trade time by making up the work hours during your personal time. This will allow you to do both guilt-free (volunteer at school and work during personal time) because you know it was a fair trade. Take breaks throughout your workday just as you would if your office was out of your home. Set lunch appointments with friends or colleagues. Or, have lunch with your child at school. Take some time during break time to fold a load of laundry or to run a quick errand. The change of pace and scenery will energize the remainder of your workday. When I first started simplify 101, I didn’t realize the importance of taking entire days off. I loved what I was doing (I still do), so work didn’t really feel like work. But, even if its fun, work is still work. It’s essential that you completely disconnect from it at least once a week. Taking time away from your job will re-energize you and enable you to bring more enthusiasm and creativity to your work. If you work from home, what strategies do you use to stay focused and productive? Thanks for sharing your ideas! Thank you so much for these helpful tips. Ill start setting more (and better) goals, and also planning my week on fridays. I make my self a cup of tea and have some cookies, which usually makes me focus. Or Ill take a small break and have a super cuddle time with my dog for a few minutes. Thanks for your comment Trine! I’m glad these tips were helpful to you. Give yourself permission to try on a schedule and tweak at as you learn more about what works for you and what doesn’t. Best wishes with your business! I’d really focus on what you enjoy doing and what you’re good at and then explore options that are a good match with those skills and interests. 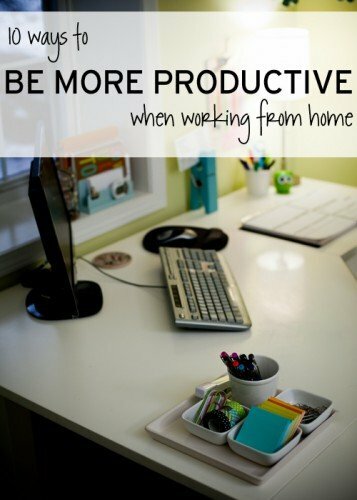 Also, if you are currently employed, you might consider brainstorming ways to do some of your work from home – assuming it is office work that could be done from home. My dad sent me this link and I’m so glad he did. What great suggestions! I have an office space, but I find myself on my laptop pretty much working anywhere in the house. It seems like whenever I get on the laptop, the distractions around the house magnify! I think it’s time to re-do my space! Thanks again for the great tips! Thanks, Daniela! I’m so glad your dad sent you the link. Good luck getting your space redone so it works well for you! Thanks for these tips Aby. I’ve been working from home for almost two years now with quarterly trips down to my company’s office in Atlanta. I used to be super productive when I worked from home when I was based in an office, but I’ve really struggled to not get distracted by household chores etc since working from home full time. These tips have gotten me thinking about re-evaluating how I work and how I look at my time – my boss has always said that it is quality not quantity that really counts so your tip on establishing a schedule and planning to I get the most qualitative things done is perfect. I’m also going to implement the distractions pad idea to keep me focused. Thankyou! You’re welcome! I’m glad you have some things you can implement right away! Thanks for letting me know! This is a really great article – it’s sometimes really difficult to get a successful balance between work and household life, especially if you have children! The points about hiring child care and remembering to take days off are really relevant because no one should sacrifice family time – you have to make time for you! Thank you Aby everything you have written hits home as I am about to embark on a new endeavor of a home based business. When I first left the office and the set routine to work from home many years ago one of the issues was not setting a schedule and being totally undisciplined in keeping to work hours – I devised a system of actually leaving the house first thing in the morning (taking the kids to school, collecting mail etc) then returned not to the rest of the house but to the office, then I would leave the office for lunch and return until the kids came home from school. I found the mindset of “leaving for work’ helped me to differentiate between work and home. Thank you again I will be putting your tips to good use.